Schools around the country are back in session, and while course loads may vary greatly, students from kindergarten to high school all have a slot in their schedules for lunchtime. On Wednesday, September 8, the National Archives in Washington will be showing the documentary film Lunch Line as part of our series of programs related to the exhibit “What’s Cooking, Uncle Sam?” Lunch Line looks at the Federal National School Lunch Program, which began in 1946 and today feeds more than 31 million children a day. The film examines the origins of the program, shows how it works today, and brings together leaders from all sides of the school food debate to discuss its challenges and its future. “What’s Cooking” contains several items related to the National School Lunch Program. 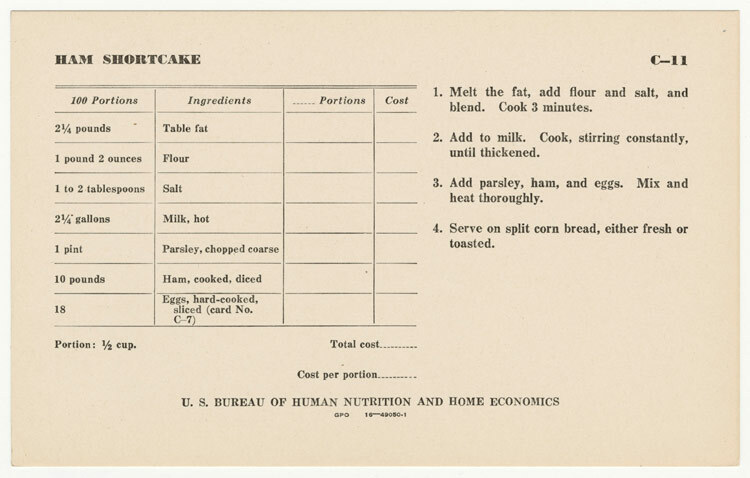 One of these is a 1966 letter, handwritten on a school lunch menu, expressing to President Lyndon Johnson the “hope that this program can continue at a reasonable price for all students in our district.” There are also recipes for 100 portions of “ham shortcake” and other cafeteria offerings. The Today’s Document Tumblr blog is even dedicating this week’s posts to the school lunch, and you can find this poster and more there. When I was in school, my lunches were packed by Mom (in a prized “Flying Nun” metal lunchbox for a couple of years). But in later years, I often got the school lunch. Come share your own observations about school lunches at the discussion after the film on Wednesday. If you can’t make it to the McGowan Theater, share your thoughts in the comments section below.